Belaire and Chicago Pneumatic compressors are both made by Atlas Copco and carry the same warranty and have the same contacts. The quickest way to reach the warranty department is to e-mail technical.support@cp.com . expressly included, the Company’s obligation shall be to correct in the manner and for the period of time provided above. HEREBY DISCLAIMED. THIS WARRANTY SUPERSEDES ALL PREVIOUS WARRANTY STATEMENTS. arising out of such Equipment. EXCEED THE PURCHASE PRICE OF THE EQUIPMENT UPON WHICH SUCH LIABILITY IS BASED. Contact C-Aire at 1-800-762-2247 or 651-462-3440. The Standard Warranty lasts 12 months from date of purchase. with C-Aire within 10 days of purchase, and perform the recommended maintenance on schedule. A) Air-intake filters and compressor oil, which are maintenance items. B) Failure due to improper installation, including absence of mounting pads, and insufficient power. C) Oil leaks 60 days after purchase (they are covered in the 60 days following purchase). D) Freight-damaged items (REJECT THE SHIPMENT or note damage on bill of lading). E) Any labor, freight, or transportation charges not pre-approved by C-Aire. F) Labor charges incidental to installation, electrical connections, repair, service, adjustment, removal, or replacement. PROFITS, AND LOST INCOME, WHETHER SUFFERED BY THE BUYER OR A THIRD PARTY. replacement parts. ALL LABOR AND FREIGHT MUST BE PRE-APPROVED AND ARRANGED BY C-AIRE. A) Properly install and start up the compressor using the checklist located at the back of this owners manual. B) Ensure the compressor is sized properly for the application. C) Maintain proof of purchase and the Installation Checklist. D) Register your Extended Warranty (if applicable). EX2404SC, EX5501HC, EX5510CH, EX5511RC, EX7201HC, EX7215CH, EX7217RC, EX7612RC only. Please note: TXRSB-3605BK Extreme Tools® Road Box is intended for on road use only. Product damage may occur during off-road transport and usage and is not considered to be a defect in product. Off-road usage is not covered by the 1 Year Limited Warranty and will void warrany. 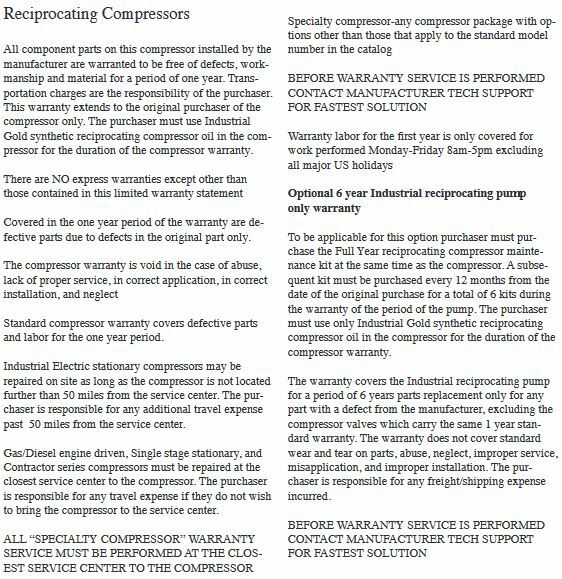 Ingersoll Rand air compressors have a 1 year warranty. When you purchase an IR air compressor from CompressorPros.com, you automatically get a Start-Up kit which extends the pump warranty to two years. M-T-M warranty policy varies based on the product. Briefly, single stage will have a 1 year warranty, two stage carries a two year warranty. Please contact us for warranty on a specific product. (only) and is not transferable. Only the Schulz Authorized Retail Store where the product was purchased can provide warranty services. the proper factory authorized service center, i.e. Briggs & Stratton, Honda, Kohler, Robin. travel/mileage expenses are allowed, see limitations. covered by this warranty. 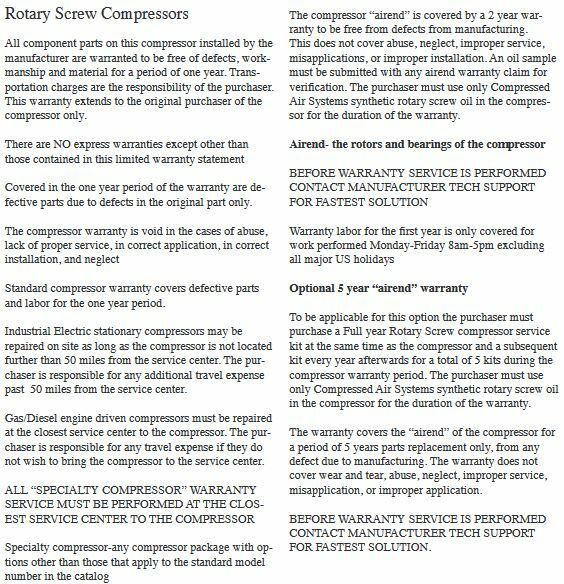 Warranty is not to be considered a free maintenance program.